Mobile Midwife has built-in help, however many questions are not specific to a particular area in the app, so we answer them here. 1. How are repeat pregnancies handled? 3. How can a client be inactivated or deleted? 4. How can a document template be edited or added? 5. How do you calculate GTPAL para? Still have questions? 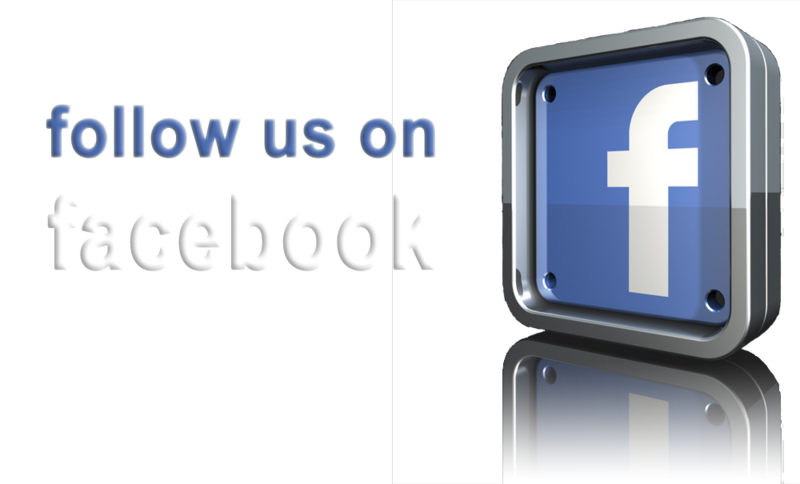 Call us or follow us on and join our facebook group to read or post questions. How are repeat pregnancies handled? There are two main approaches to handling repeat clients. First and foremost, the previous pregnancy record should remain signed off (locked) and untouched under the Inactive tab. The most straight forward approach is to have the client visit your client portal again and fill out all their information from scratch. This approach ensures that the client record has up-to-date information from the client address to their current medications. The second approach is to open their previous record under the Inactive tab and press the "Copy Client" button located on the same menu as the Email and Print buttons. This feature creates a new client record and copies only the information under the Basic, Past Pregnancies and Health tab in the Client Info section. The new client record will appear under the Primary Care tab since the Pregnancy tab "are you pregnant?" field is not set to Yes. Then the "Send Client Access" button can be pressed to email the client a unique portal link and auto generated password. The client can access the link from any device to enter their current pregnancy information under the Pregnancy tab and update their info under the Basic, Health and Past Pregnancies tab. Alternatively they can utilize your iPad during their first visit to update this information. The answer to this situation is the same as the answer for How are repeat pregnancies handled?. The Copy Client feature can be used to copy the old client record. This feature only copies the data under the Basic, Past Pregnancies and Health tab. The new resultant client record will appear under the Primary Care tab. To have the client verify and update their information before their Gyn visit the Send Client Access button can be pressed (located under the Print and Email buttons) to send the client a unique portal link with an auto-generated password. Alternatively, the client can review their information during their first visit. How can a client be inactivated or deleted? Upon opening a client record press the trash icon located in the upper right corner of the screen and choose Inactivate or Delete. Clients more than 15 weeks postpartum are automatically moved to the inactivate tab if the "Automatically move Postpartum clients to Inactive 15 weeks after delivery" field located under the Settings->Account tab is set to Yes. How can a document template be edited or added? A document template can be edited by tapping on any document thumbnail under the Templates tab and choosing "Edit Template". This does not allow a templates text to be edited but it does allow the fillable text fields, check boxes, initial or signature boxes to be moved or added anywhere. To edit the text or layout would require a fully licensed copy of Adobe Acrobat Standard or Professional. These licenses are expensive and probably not worth the investment. The recommended approach is to add a new template. Create your document in Microsoft Word or some other word processor and then save the document as a PDF file. Then email the PDF to yourself and open that email on your iPad/iPhone, tap on the attachment and choose to open it in Mobile Midwife. Then under the Templates tab press "add template" and choose the document you just sent over. Microsoft Word versions of our consent forms are available under the Files section in our closed Facebook community. Watch this video on how to create and use Templates! How do you calculate GTPAL para? Gravida = number of pregnancies including ectopic and any length of gestation. Multiple fetuses still equal one pregnancy. Term = number of pregnancies carried to 37 weeks or greater regardless of birth outcome. Multiple fetuses still equal one Term count. Preterm = number of pregnancies carried to 20 weeks but not as far as 37 weeks regardless of birth outcome. Multiple fetuses still equal one Preterm count. Abortions = number of pregnancies carried less than 20 weeks regardless of how it terminated. Ectopic pregnancies are excluded. Multiple fetuses still equal one Abortion count. Living = number of living children regardless of gestation length or delivery method. If the "child still living?" field is set to No under Past Pregnancies then that child will not be included in the Living count. para = number of pregnancies carried to 20 weeks or beyond regardless of birth outcome. Multiple fetuses still equal one para count. The first step in charting a miscarriage is to open up the client record and navigate to the Labor & Delivery->Newborn tab. From there the "outcome" field should be set to "Miscarriage". This will cause the client record thumbnail on the Home screen to clearly indicate that this client is a miscarriage so as to avoid any potential miscommunication from another midwife or staff member. It is recommended to keep this client record active until the miscarriage has run its course. Any follow up postpartum visits should be charted under the Postpartum tab. Then the client record can be inactivated by pressing the trash icon from the Summary or Basic tabs and choosing "Inactivate". To properly chart a transfer during labor, navigate to the Labor & Delivery->XFER tab and enter at a minimum the "time of departure". This is the key field used by your practice statistics and is used to indicate in several places, including the home screen thumbnail, that the client was a transfer. Once baby is delivered, populate the Newborn->outcome and DOB fields. This will place the client record in Postpartum. If the client continues postpartum care with your practice you can continue to add new postpartum visits as you would normally do with a client that you delivered. If the client does not continue care under your practice then you can inactivate the record by pressing the trash icon located under the Client Info tab and choose "Inactivate". If you transfer a client out of your care before labor navigate to the Prenatal->XFER tab and populate the "time of transfer" field. This will cause the client to be labeled as a prenatal transfer. This status will be reflected in the practice reports and statistics and also be labeled as "XFER" on the client thumbnail. After populating the XFER tab you can inactivate the client by pressing on the trash icon under the Client Info->Basic tab and choosing "Inactivate". You will still be able to edit or add records under the client's billing tab when the client is inactive. All other data however will be un-editable. Sometimes you end up with two of the same client with some information in one record and different information in the other record and you want to merge the two. This can happen if you created a client record for them at their first visit and then later they went to your client portal to create a new record. This rarely happens now though because we added the ability for clients to login to an existing record in the client portal. You can press the "Send Client Access" button located on the same menu as the Print and Email buttons to email instructions on how to login to an existing record to a client. To merge two records first decide which record you want to merge into and which record you want to merge from. It doesn't really matter which direction you go but we typically recommend merging the record that you created into the record that the client created. Once you pick which record you want to merge into, open that record and double tap in the client record number field located in the Basic tab to copy it to the clipboard. Then open the record you are merging from and press the "Merge Client" button located just under the Print and Email buttons. Then double tap in the record number field to paste the record number you previously copied. Choose which categories you wish to merge and press Done. The merge feature does not delete the source record. It is recommended that you simply inactivate the source record instead of deleting it in case there is still data in it that is important which you did not merge over. Sending an invoice to a client can be done easily with our client billing feature. Open any client record and navigate to the Tasks & Billing tab. Open the Billing side tab and then press "add entry" at the top. Press "add charge" and choose the appropriate procedure code(s). If there are any payments, tap on the "payments/adjustments" button, choose "payment type" and enter the payment amount. Then press "send invoice" to generate a professional invoice. Mobile Midwife EHR now has the ability to submit professional and institutional claims electronically or by paper to any payer. It is free use the paper billing however there is a fee of $39/month to be able to submit claims electronically. Please contact us to activate electronic claims for your practice. To add a claim, open any client record and press on the Tasks & Billing->Insurance Claims tab. Then press "add claim" in the upper right corner and choose "add professional claim" unless you are billing for facility usage in which case choose "add institutional claim". The next step is to choose the claim type of Paper or Electronic. Then choose the Payer. The Payer information is pulled from the Financial Information section in the client's intake. Then choose your diagnoses and procedure codes. Then press "Print Claim". You will have the option to print on CMS 1500 special paper or directly onto plain paper. 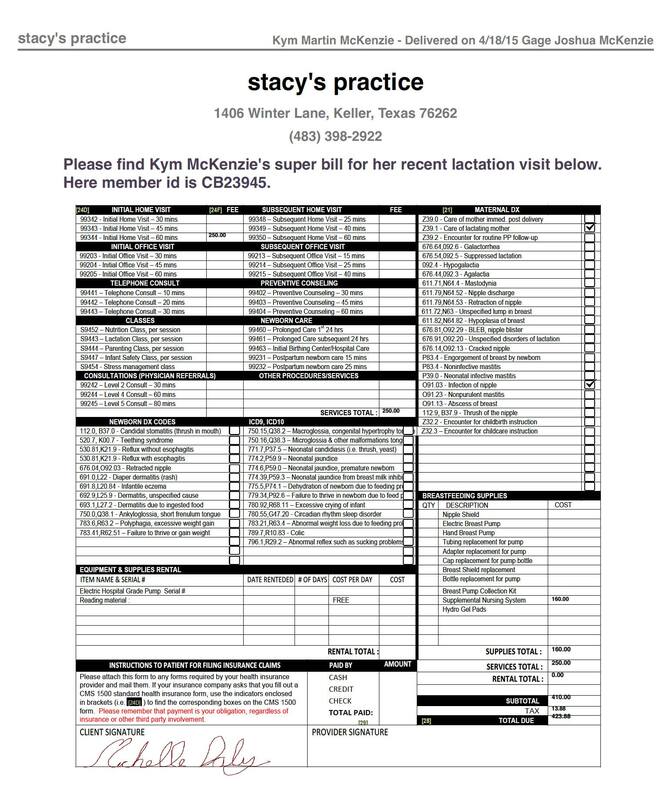 Mobile Midwife EHR has a superbill document template included in Templates section. To access it open any client record and press "add document" under the Documents tab of any client record. Then choose the Superbill template. A thumbnail of the document will appear in the client's document list now. Touch on the thumbnail and check which procedure or diagnoses codes are applicable for the visit, enter the dollar figures and press Save. Then press the Email button located on the action menu. The action menu is a button that looks like a square with an arrow pointing upwards out of it on the tool-bar. In the Data Export screen that appears set the "include letterhead" field to Yes and optionally enter a comment in the title field such as "Please submit this superbill to your insurance company for reimbursement. Call me anytime at the number above with any questions". Then choose the "Superbill" from the documents section and press Done. Never bother entering your password again! With the new touch id feature available on the iPad and iPhone you can now login quickly to Mobile Midwife. To enable this feature first login into MM with the user account that you want associated with your finger print. Then open the Settings->Users tab and press the "Set Touch ID" button at the top of the screen. You will be asked to press your finger on the home button and enter your password again for Mobile Midwife. That's it, now log out and use your finger print to log back in! There are three things guaranteed in life - death, taxes and a new MM update every two weeks or less. Instead of having to manually update MM to the latest version you can configure you iPad/iPhone to automatically update to the latest versions as they come out. To do so open the iPad Settings app, scroll down and press on the "iTunes & Appstore" option and then set the "Updates" field to on by sliding it to the green position. Mobile Midwife EHR integrates with many lab companies including Quest, LabCorp, GenPath, BioReference, CPL, Interpath, RML, MDL, PAML, ACL, PathGroup, Dortivech, Healthscope, ABC Lab and others. To integrate your Mobile Midwife account with your lab company contact us and let us know who you process labs with. If you use Quest Diagnostics then you can simply visit Quest's website here. You will be able to select Mobile Midwife from a list of EHRs and submit your request. If you use LabCorp please go to the Rep Contact Form and request in the comments section to have your LabCorp account integrated with Mobile Midwife EHR by Daly Enterprises, Inc. Lab integration shaves hours a week off your work load and improves the data integrity of your records by reducing human error. Never get caught again at a transfer without having your lab records attached to your client record. Once you are integrated with your lab company, lab results will automatically be attached under the appropriate client record as they are completed. Both the discrete values of all the lab observations will be entered under the client's labs tab and the original PDF document will be attached also. Values that are out of range will be highlighted in red and also appear under the Core Information box at the top of every screen. When lab results are received, an email notification will be sent to you. If a lab could not be matched to an existing client then a warning message will appear on the Mobile Midwife home screen. To assign these unmatched lab results, open a client record and press on the cloud button located at the top of the screen under the Labs tab. 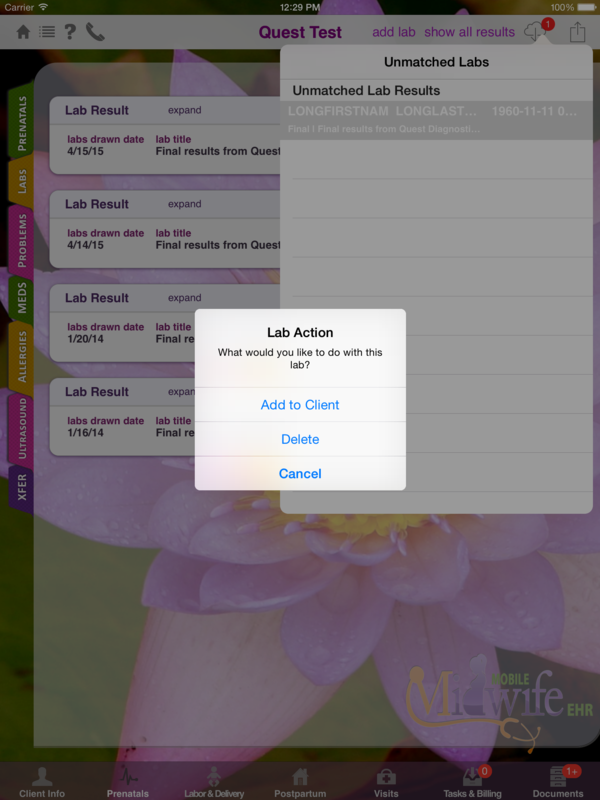 A list of unmatched labs will appear with the name of the client, date, and the type of lab order. Touch on the lab to attach it to the current client record you are in. 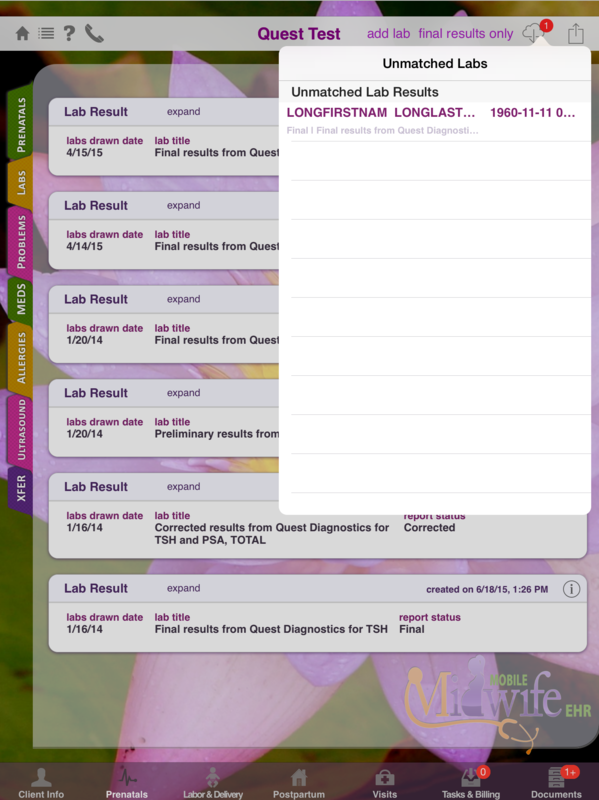 The following is an example of what the notification looks like that appears when you login to Mobile Midwife and a lab result could not be matched to a client record. The following is an example of the email that is generated when a lab cannot be matched to a client. 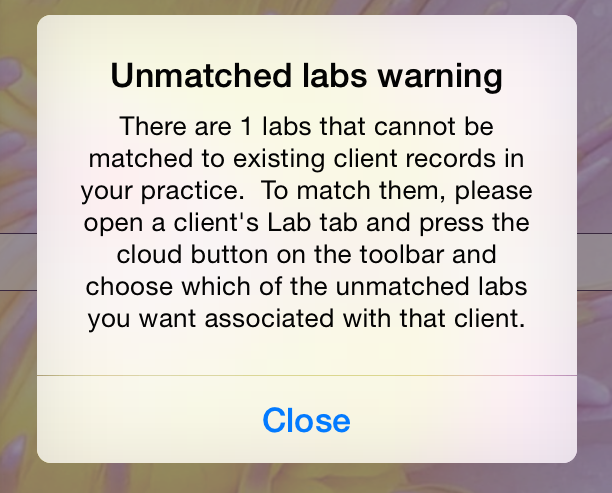 The following is an example of unmatched labs list that appears under the Labs tab when the cloud button is pressed. After tapping on an item in the list, press "Add to Client" to add it. The Mobile Midwife client portal enables your clients to create or login to an existing client record. After creating a Mobile Midwife account, you will receive a client portal email that you can forward to new clients as you get them. The client portal email can also be generated by going under the Settings->Account tab in Mobile Midwife. From there, press on the "email client access URL" button. This will launch the Mail app on your iPad/iPhone with a new email that has the body populated with your unique client portal URL and detailed instructions and troubleshooting tips for your client. Your client can access the client portal from any Windows, Mac, Android, iPad or iPhone device to fill out their health history. If they access the client portal from an iPad/iPhone or Android device they will also be able to sign your consent forms and financial agreements and take pictures of their insurance card if applicable. Once your client has completed their record they will click "press here when finished" and a notification email will be sent to you. You can then login to Mobile Midwife on your iPad and view the record. A welcome email will also be sent to you and the client with their user name and password that they can use to log back into their record anytime to make changes. If a record already exists for the client that you may have created during their interview or first visit you can instead have them fill out their information in that record instead of creating a new one. To do this, open the client record and press on the "Send Client Access" button located on the same menu as the Print/Email buttons. This will send the client an invitation email to login to their existing record to finish filling out the information.